No not mothers milk…that happens naturally when you have a baby! The wonders of nature! A couple of years ago we did lots of experimenting with making our own milk replacement for on cereal, etc as we no longer drink cows milk. This is why. It is really easy, and doesn’t take up too much time. All you need is a liquidizer (and the ingredients, of course!). It works out much cheaper than buying it already made (and much cheaper than cows milk) and we can choose organic ingredients and know that the ‘milk’ has no funny additives or preservatives, and has no weird dioxins perhaps leaked from packaging. Whizz up in liquidizer for a couple of minutes and then pour through cheesecloth, muslin or similar. Bottle, put in fridge and use within 4 or 5 days – it’s that easy! 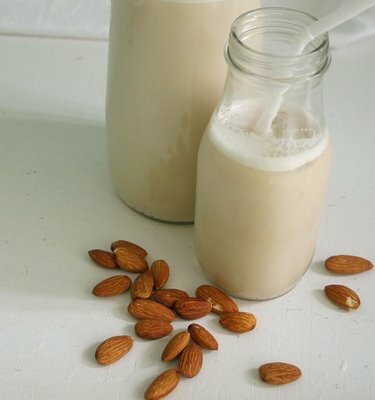 Almond milk is full of potassium, magnesium, Vitamin E, and has less calories than a glass of cows milk. You can use the leftover pulp for baking too! We’ve experimented with Rice milk quite a bit and it never turns out quite like the Rice Dream that you buy (possibly because they use white rice and we prefer to use untampered with brown rice), but it’s still pretty good. The remaining bits from all these can be mixed with flour, raisins, oil, seeds, sugar and whatever else you fancy, and made into biscuits!